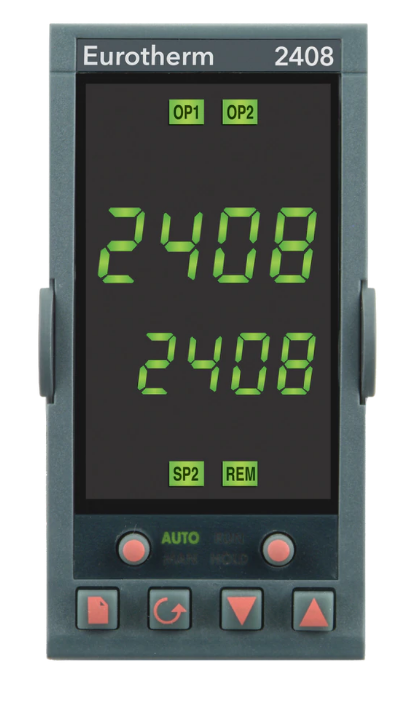 Specifications︰ The 2408 1/8 DIN unit is a high stability controller with an extensive range of options. Either PID, ON/OFF or Motorized valve control can be configured, satisfying both electrical and gas heating applications amongst others. A setpoint programmer with up to 20 programs of 16 segments is available. The controllers accept a range of plug-in modules, heating, cooling, or process outputs, analog retransmission, second process value input and remote setpoint. An advanced PID control algorithm gives stable 'Straight-line' control of the process. A one-shot tuner is provider to set up the initial PID values and to calculate the overshoot inhibition parameters. In addition an adaptive tuner will handle processes with continually changing characteristics. Up to four process alarms can be combined onto a single output. Alarms can be full scale high or low, deviation from setpoint, rate of change or load failure alarms. Available with either EIA485 2-wire, 4 wire or EIA232. With industry-standard protocols including: Modbus, DeviceNet®, Profibus DP, and Eurotherm® Bisync.